Hey, Chalk & Notch Fans! 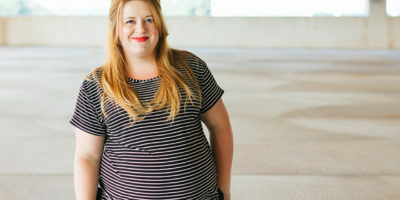 I’m Loni of Havin Sew Much Fun, and I’m excited Gabriela has asked me back to share another hack of the Pixie Tee pattern with you. I have been dreaming of making a sweater knit Pixie with a cowl neck since June when I made a Pixie dress in pattern testing. The modifications I made to achieve this cooler weather Pixie are incredibly simple, but they really change the vibe. 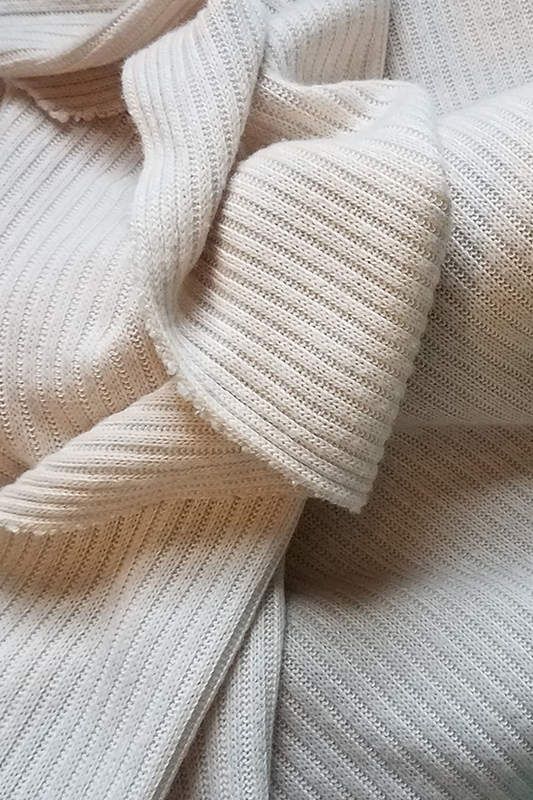 My muse was this creamy rib knit sweater fabric, a designer overstock I scooped up in the spring. While it’s very stretchy and drapey, this fabric doesn’t score nearly as well on recovery. 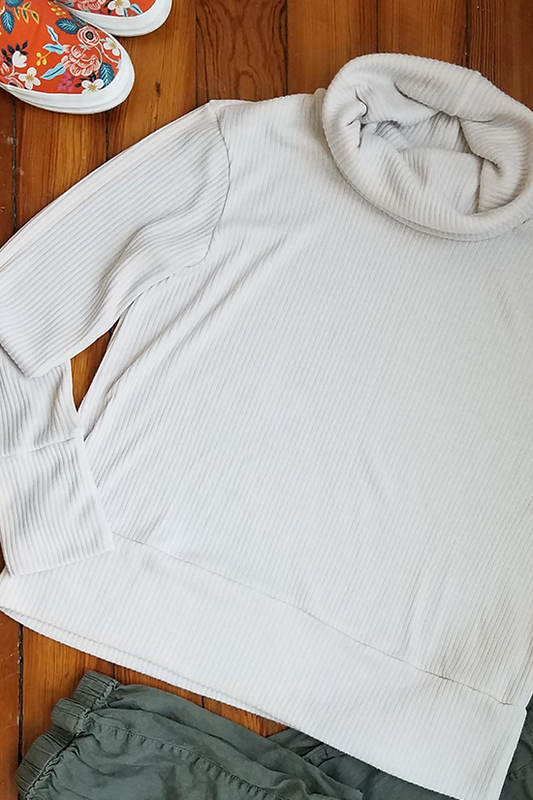 It’s just right for a slouchy, relaxed sweater. The main front and back pieces are unmodified from the Pixie’s banded view, and I used the same size I’ve used for all my Pixies. First, I shortened the sleeves by 1.5″ (4 cm). Then I added 4 inches (10 cm) to the height of the cuff pattern piece and removed the taper for a more relaxed look. Since the result (once folded) is an added 2 inches (5 cm) in sleeve length, the net effect is a slightly longer sleeve overall. After I added the same amount (4 inches/10 cm) to the height of the waistband so the sleeve cuffs and waistband finish at the same heights. That leaves us with the neckline. This loose turtle- or cowl-style neck is a simple rectangle-based tube, 10 inches high once attached. 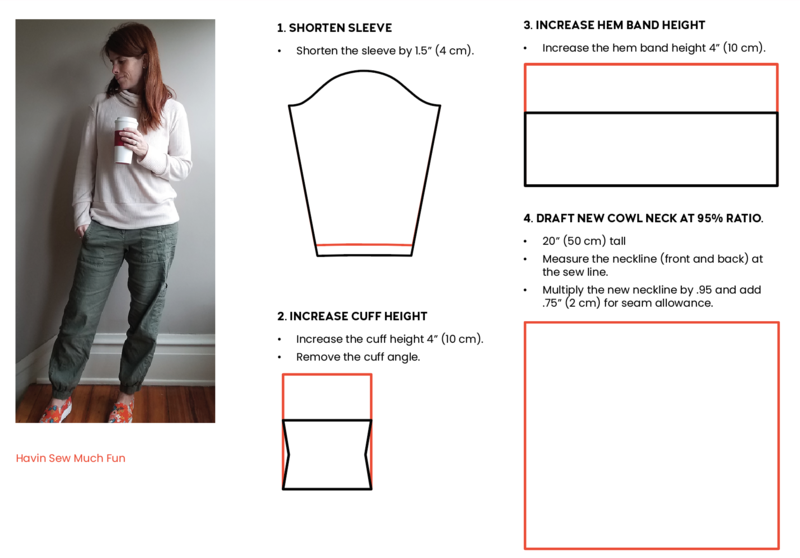 Draft a pattern piece that is 20″ (50 cm) tall and the width is 95% the length of the neckline plus seam allowance. 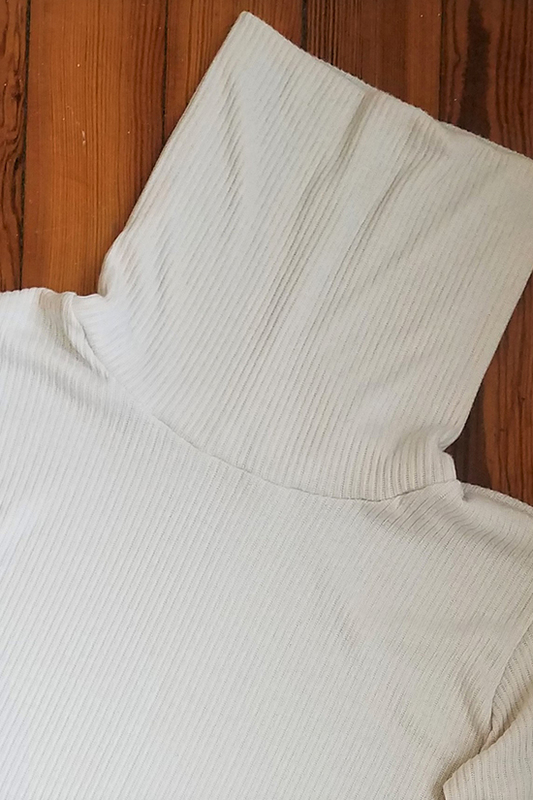 This means the cowl is only stretched very slightly in attaching it to the neckline, pulling the neckline in and giving it some support while also being dramatically fuller. You can download a PDF version of the tutorial for your reference here. 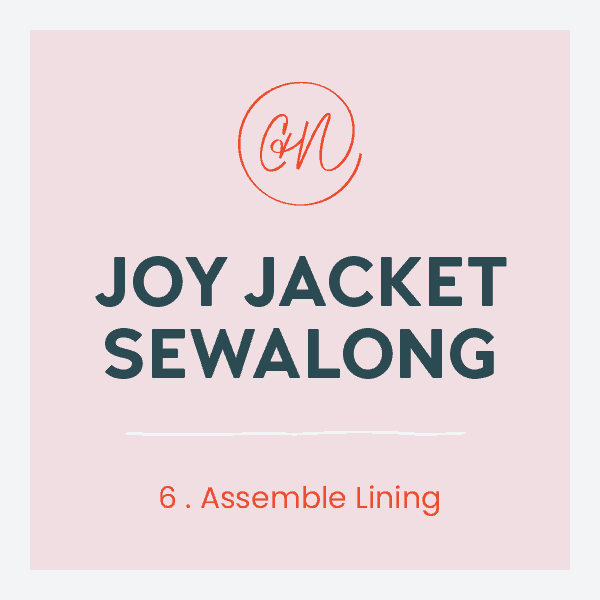 The construction is straightforward and follows the sewing tutorial as written. 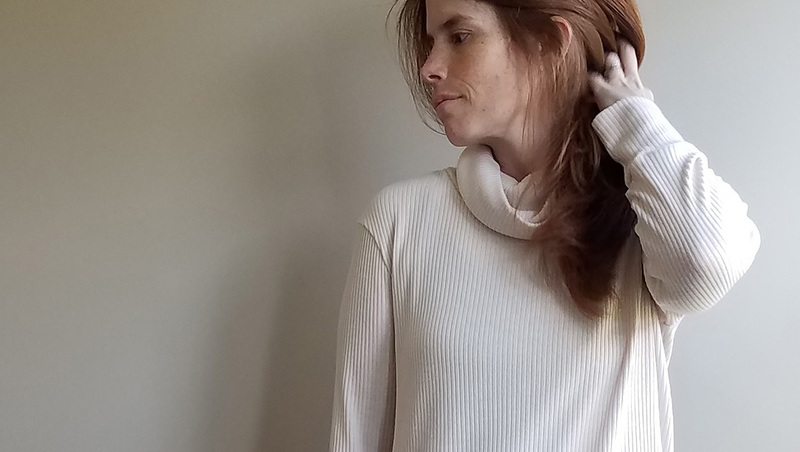 It is of note that I didn’t stabilize the shoulder seams on this sweater, which contributes to the overall relaxed and elongated style. Voila! 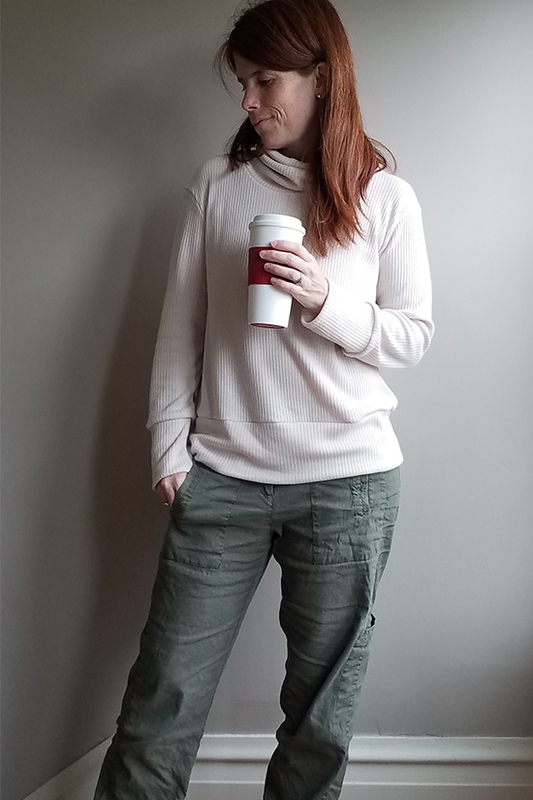 A slouchy cozy stylish sweater. Just add your favorite hot beverage (we’re looking at you, Pumpkin Spice Latte) and you’re ready for fall.